There may have been a preaching cross at Locking during Anglo Saxon times and an early Celtic Norman church in the 11th Century. In 1210 Woodspring Priory in Kewstoke, near Weston-super-Mare, was founded by William de Courtenoi, and Geoffrey Gilbwyne donated "the manor of Lokyng and all belonging to it" to this priory. The current Locking church is sited on the church that the monks of Woodspring Priory dedicated in 1217. Their patron siant was Saint Victor of the Order of St Augustine, the first Archbishop of Canterbury (597 - 604), which is the likely reason why the church at Locking is dedicated to St Augustine. The only part the first Norman church that remains today is the unique carved stone font which dates from the 11th Century. The other two oldest parts of the current church are the tower which dates from 1380, and the pulpit which was carved c1480. 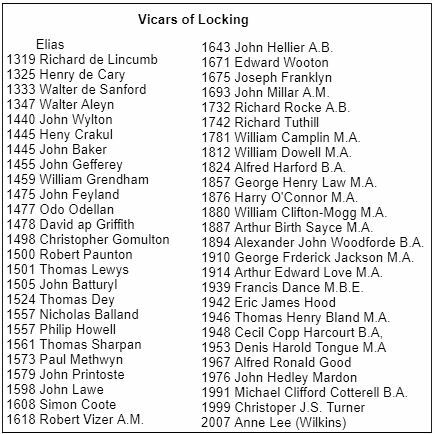 The list of Vicars of Locking shows that Norman names with the French 'de' still dominated in the 1300s. Vicars were not resident in the village until 1824, and as they held the living of more than one parish often appointed curates to take services. By 1800 the church was becoming very dilapidated and a rate of 1d (one penny) in the £ was levied on 35 rate payers in the village to help pay for repairs - a decision of the Merchant Venturers whose own proposed contribution met with disapproval as not being generous enough! Eventually a compromise was reached, and in 1814-15 the church was renovated and the north aisle built at a cost of £233.3s.5d. The picture of the church in 1843 shows it looking very much as it still does today. A large Victorian Vicarge was built in 1879 with a long sweeping drive bounded by tall hedges of laurel. Within its extensive grounds (now the site of houses in Lychgate Park) were a tennis court, a kitchen garden, a large greenhouse containing a vine, and a small woodland area. It also had a coach house and stables which were later converted to form the church hall. The old vicarage was demolished and replaced in 1969 with the modern vicarage, and the coach house with the modern St Augustine's Church Centre. The most fascinating part of the church is the font. 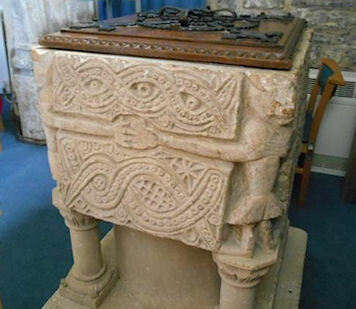 The carving and inter-twined serpents in the panels are characteristic of Celtic art, placing it in the 11th century. However, the figures at the corners are dressed in armour of the style of Richard I (1189 - 1199). A few years ago, it was suggested that their costume is characteristic of Henry V (1413 - 1422) because of the head-dresses of the figures are those which were worn at that time. These head-dresses were cut off during alterations in the last century, when the rim of the font was reduced in height to make it level. But it is possible that the changes were made on the figures to keep costumes up to date with the styles of the time, and the Church built in 1380 might have replaced an earlier Church built in either the 11th or late 12th Century. The font stands beneath the tower, but this was not its original place. The south side lacks ornamentation, and therefore this would have been facing a wall. Also it originally stood on one pillar, part of which was found in the Churchyard in the 1970s and now stands in the porch. The four corner pillars were added in the 19th century to ease the weight on the corners. The font has been used for over 800 years. Think of the number of people and babies who have been baptised in it! The pulpit is one of the finest in Somerset. 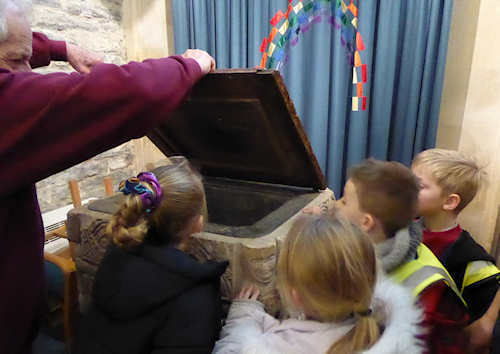 Since there are five other octagonal stone pulpits in other churches in the local vicinity it is likely that they are the work of one school of craftsmen. 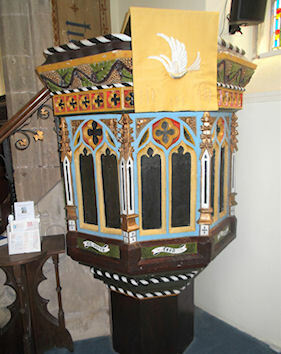 Beneath the Victorian paint, traces of what may be original colouring can be seen, and the pulpit may have been gaily painted with vegetable dye when first carved in about 1480. It was repainted in the 1970s. There is a War Memorial plaque to villager Sapper Glimstead of the Royal Engineers who died in the 1914 - 1918 war. The Lych gate was erected in 1910 by the Parishioners in memory of the Rev A. Woodforde vicar of the Parish from 1894 - 1909. The stained glass windows are Victorian and are good examples of this period. There is one more recent window. St Augustine's, Locking, has a ringable peal of 6 bells. The fourth bell is the oldest original bell, cast in Bristol circa 1380, and is one of the oldest in the country still in regular use. It has some interesting chisel marks and is of listed status due to its age. The tenor bell dates from 1792, and is inscribed 'I to Church the living call and to the grave I summon all'. From George Massey's account in his book 'The Church Bells of Somerset', it is recorded that there were originally 4 bells in the tower dating back to the 14th Century. The peal was augmented to five bells in 1921 and then to six in 1946 to commemorate victory in the 2nd World War and appropriately called the 'Victory Bell'. The bells were rehung on a cast iron metal frame in 1904 and refurbished in 2018. An old beam dated 1631 and taken from the belfry bares the name of John Plumley, Lord of the Manor. The old door on the inside of the stairs leading to the top of the tower is original 14th century. The church tower dates from 1380. It stands on a hill looking out to the nearby coast. Unfortunately the wind and rain from over 600 years was found in 2016 to have caused serious damp problems in the tower's ancient stonework and wooden beams. Bell ringing and access to the tower including the Norman font had to be stopped. 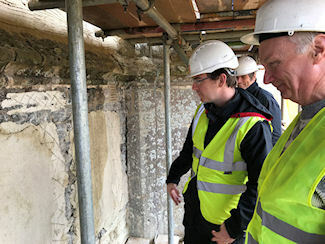 Work started in September 2018, following 18 months of fundraising, on the restoration of the church tower and bells. The fundraising included events, concerts, donations from local people, and grants from the Heritage Lottery Fund and local charitable trusts. 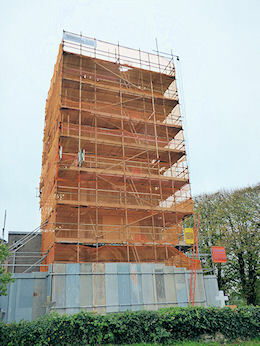 Scaffolders, stone masons, carpenters and electricians have been hard at work over the past months. Stonework repairs have been completed and the external rendering replaced with lime based render. Rotten wooden beams that support the ringing chamber floor have been repaired with spliced in sections and metal brackets. Repairs on the tower roof have included a new door and the weather vane has been refurbished and painted up in a gold colour. In the belfry the bell frame ends have been treated and mortaring replaced to strengthen where they are supported in the tower stone walls. A considerable amount of accumulated bird guano has been removed from the belfry floor and new stainless steel meshing fitted over the windows to help keep the birds out. Bell specialists Nicholson Engineering are scheduled to complete restoration work on the bells in February 2019. This includes refurbishment of the clapper assemblies, hinge pins and other items. 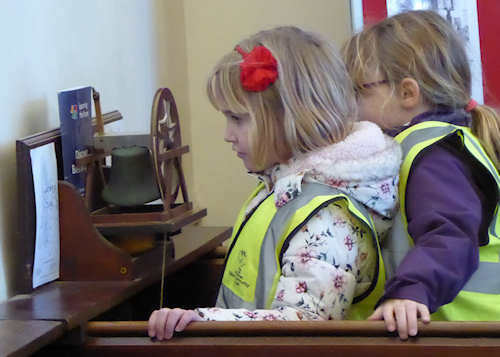 We are hoping that the bells will be ready to ring out again at Easter 2019 for the first time in over two years and plan to make it a very special event. The church's set of 12 handbells, which had not been used for over 40 years, have been sent for refurbishment to Bells of Whitechapel bell foundry where they were made over 100 years ago. The will be used after refurbishment to encourage young ringers to learn ringing and ring out at carol services and other events. A Grand Event is planned for Saturday 6th April 2019 to celebrate the restoration of the tower and bells. Everyone from Locking and the local area is invited. The Archdeacon of Bath is attending to lead a rededication service at 11 am followed by a lunch open to all in the Church Centre. Bell ringers from several local churches will be ringing, and afterwards visitors will be invited up into the ringing chamber to see how it is done. We also plan to ring the handbells following their restoration. 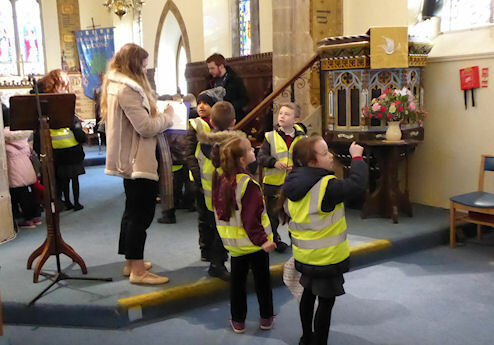 In January and February 2019 children from Locking Primary School visited the church as part of the Local Heritage Project. 1. Why do we have a Church in Locking village and what is it called? 3. Where would you find the church bells? 5. The large carved stone in the tower is called a font. What is it used for? Can you draw it? 6. What are the figures carved on it? Can you draw one? 7. What do you think is under the big wooden lid? 8. Turn around and look by the wall. Can you see a brightly coloured pulpit? Write the words on the front of it. Can you draw a picture of it? 9. What is the pulpit used for? 10. Can you find the organ. What is it used for? 11. Can you see the stained glass windows? How many are there? 13. At the end of the Church is a large table behind a rail. It is called the altar. There are two windows above this. Who is the person in each? 14. In one of them he is carrying an animal. What is it? 15. Inside the Church, at the altar end, are some panels carved by people years ago. See if you can find some of their names hidden in the patterns. 16. On the stone pillar in front of the organ is a list of names. Who were the people on the list? 17. On the wall by the door you will see some writing in a frame. It tells us about a man called Sapper John Glimstead. What happened to him? 18. Can to see the fancy lights called chandeliers? How many candle holders are there in the one nearest to the organ? 19. In the old days the school used to be by the Church Centre. It is still called the School House. 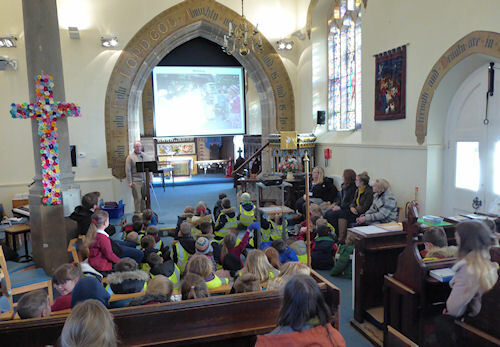 Can you find a picture of the schoolchildren outside the Church? 20. As you enter the Graveyard there is a covered gateway called the Lychgate. What used to happen there? 21. What is the graveyard for? 22. What are all the big stones outside the church with writing on them?